Rambling Moose: Welcome To Florida. 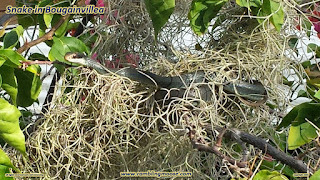 We Have Snakes In Bougainvillea. Welcome To Florida. 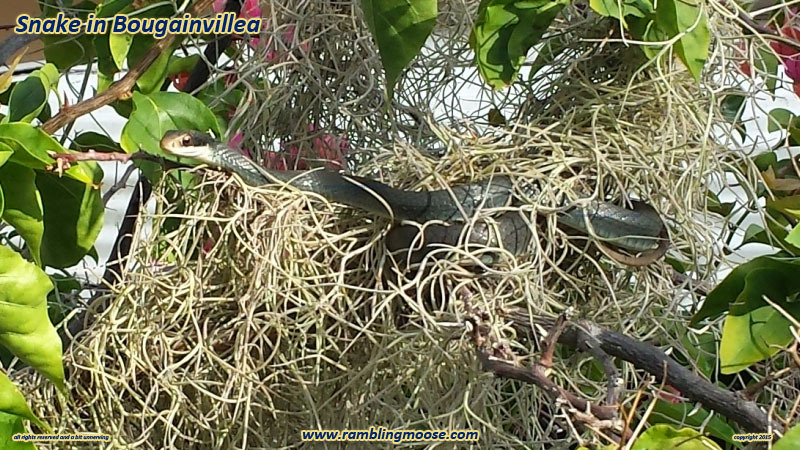 We Have Snakes In Bougainvillea. Yeah. I didn't expect this. I have watched my fair share of nature documentaries. I have probably watched enough for your fair share of nature documentaries. I simply did not expect this. But I will say I did what I'd expect of anyone else. I took a few pictures, then walked away. No, I won't whack a snake like in the BC Comics. I'm no caveman. I think these Black Racer Snakes are actually beneficial, and I know they are not poisonous. I did need a reality check about pulling weeds though. Yes, whack your weeds first. Then pull them. The critters will move away unharmed. That includes Black Racer Snakes. I walked out my back door for this little wildlife encounter this particular morning. I take Rack out after I have my breakfast so he can water some trees. Usually my big palm tree behind my bedroom window. Behind the bedroom window there is a post with a struggling bougainvillea. Since you can root bougainvillea with a thumb sized piece of branch with a few leaves on it that were carelessly dropped in your pots that are watered regularly, there is no reason why this plant should struggle. That is neither here nor there. The Spanish Moss I threw into the thing a couple years ago was so thick that it looked like a herd of ZZ Top impersonators had left their fake beards in the thing and walked away. I tore out a full trash can of the moss one afternoon on a whim, and it's growing back happily. It also made a great place for this little snake to warm in the sun. It was just high enough to catch the early rays as the sun came up over the Bahamas, so there it parked. I just didn't expect it. I should have. This is the place where the waters are beautiful and run slowly to the sea but you should never swim in them because an alligator will eat you. If not an alligator, we have ball pythons, and I have heard of piranhas from time to time, although that could be an urban legend. So, if you're going to the yard to do a little weeding, get a bamboo pole. Whack the ground a few times. The creatures will move on their way. It's also why Code Enforcement will cite you if you let your grass grow too long. There be snakes in these woods! On the other hand, this video will prove that they're not poisonous. At least they aren't to a 12 year old girl. I'm not a 12 year old girl, so my recommendation is for you to let them be where they are.